All canceled reservations received 60 or more days prior to arrival are subject to a 10% cancellation penalty of the entire stay. Reservations canceled within 59 days of the scheduled arrival date are subject to a penalty equal to the cost of 1 nights' stay. Pets are welcome at this property. Please inquire about price, weight and breed restrictions. The address is 8931 Rapid Lightning Road, Sandpoint, ID 83864. They are located 17 miles outside Sandpoint. Take Hwy 2 to Colburn Culver Rd. Turn Right and continue for 8 miles on paved road. The last mile before Elysium Woods is on county maintained dirt road. Take the left turn at the Y in the road and go over the bridge; our entrance is the next driveway on the left. Elysium Woods is different from any camping experience you’ve ever known. Their name Elysium comes from an ancient Greek word meaning “place of blessing.” The cozy yurt has been outfitted with comfortable furniture and high-end accoutrements. Your blood pressure will ease and your worries flee as soon as you unpack and open your favorite reading material. The 21-acre forested property is ideal for honeymoons or just weekend or weeklong getaways from the hustle and bustle. You’ll be miles away from city noise, so only the birdsong and breezes blowing through the cedars and the “talkin’ crik” will greet you every morning. 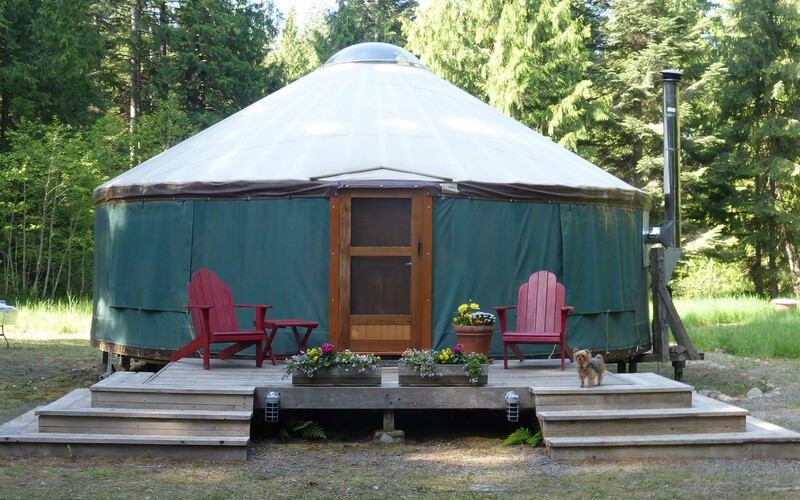 This large yurt comes furnished with all you will need for your glamping vacation. The kitchen comes with a sink, standard-size refrigerator, microwave, electric stove with two burners, storage and counter space. The bedroom area includes a large bed with linens and pillows. There are also chairs, a table and a fireplace inside.